The Hog’s Back Brewery located in the heart of Surrey (and one of my favourite local breweries!) has seen a 30% rise in its beer sales since 2012 – and due to this success is now needing to increase production capacity to help meet demand and increase it’s national reach. “We are really on the front foot as a team. Redesigning all of our packaging in 2012 made a great difference in showing that we mean business. The new labels combine the traditional old world values for which we are known, with a more colourful, exciting feel. “New fermentation and conditioning vessels have been ordered by head brewer, Miles Chesterman, for delivery later this summer, which will double production capacity by mid-autumn. This is part of a £500,000 investment programme we are undertaking this year, with further significant investment following next year”. 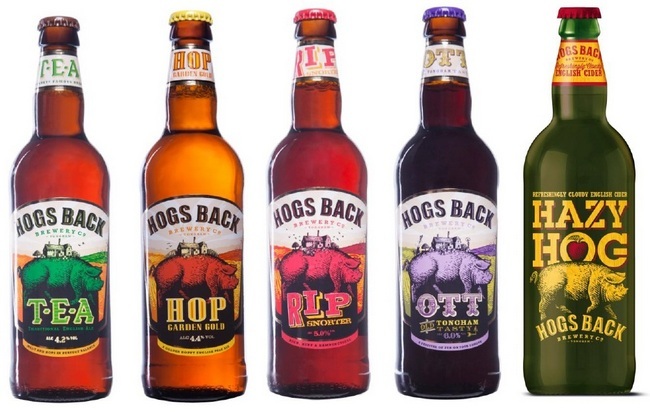 The brewery’s increased capacity will allow Hogs Back’s beers to be sold much further afield in the near future. “Though TEA is our hero, it is fascinating to see the recent rise of RIP Snorter, which will be in cask in Punch’s Finest Cask Guest programme in October and November. “And it is exciting — as a brewer — that our recently launched Hazy Hog cider has been universally praised, and seen as very different. It has lower carbonation and a more apply taste, and its cloudiness seems — quite rightly — to give reassurance that it is natural and authentic, in the Breton style. “Hazy Hog is building a big following on draught in local pubs and was in Spirit Group’s Taylor Walker pubs for their cider festival in June and early July. We expect to announce some national listings for the autumn. Traditional English Ale (TEA, 4.2%) has added to its presence in Waitrose with a new listing in 300 Sainsbury’s stores, all Whole Foods supermarkets and in Tesco in the south of England by the autumn. Its rich full-on flavours of sweet barley malt, balanced by subtly understated Fuggles hops, make it taste bigger than its 4.2% ABV. Its growing distribution in Taylor Walker pubs in London and the south east is helping to spread the reputation of the brand nationally. HOP Garden Gold (4.4%) is spicy, floral and refreshing, using hops grown a mere mile from the brewery. It is in over 100 Waitrose stores and stocked in mini-bars at The Savoy. OTT (6%) our strong black ‘old ale’ — with powerful roasted malt flavours and real smoothness on the palate — is in Waitrose and in local Tesco and Asda stores. AoverT (9%) won gold in the barley wine category of Champion Winter Beers of Britain 2013. It is in hiding, waiting to be bottled as a bottle-conditioned beer. RIP Snorter (5%), our gentle, easy, rosewood coloured ale is in Booths supermarkets, its crystal and chocolate malts giving it an alluring smoothness with a gentle suggestion of hops. This is one of head brewer Miles’s favourite beers. Hazy Hog (5%), our recently launched cloudy cider, is in all 12 Whole Foods supermarkets.